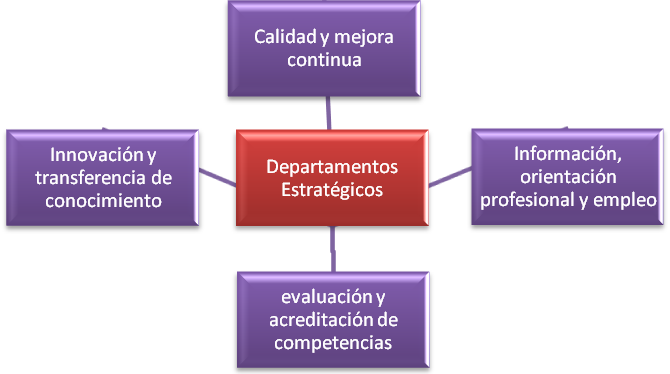 The Strategic Departments carry out the functions related to their competence field., including to submit proposals for the elaboration of the Functional Project of the centre. They consist of a team of teachers lead by the Chief of Department, who is appointed by the Managing Director. Main function: Coordinate and manage the procedures that allow workers to officially prove their professional competence. By these procedures (PEAC), All workers who comply with the requirements are accredited their professional competence, whatever the way the competence has been acquired. Main function: System maintenance quality management and continuous improvement, as well as the implementation of new systems. Main function: Driving Innovation in Vocational Training, paying attention to those aspects of teachers training related to innovation and encouraging applied research. It can also activate the collaboration with companies, social agents and any other organization and also with the surrounding business network.